In Michigan it is said no dessert quite approaches a cherry glaze pie for elegance and for making an impression on the passing guest. Mix the sugar, salt, cornstarch and flour and gradually add milk. Cook over low heat, stirring constantly until the mixture thickens and comes to a boil. Let it boil 1 minutes, remove from heat and whip a little of the mixture into beaten egg yolks. Then stir the eggs into the cream filling and heat, while stirring constantly, until the combination has boiled 1 minute. Remove from stove, add butter, vanilla and cool. Pour into 9-inch baked pastry shell. Beat together and fold into whipped cream. 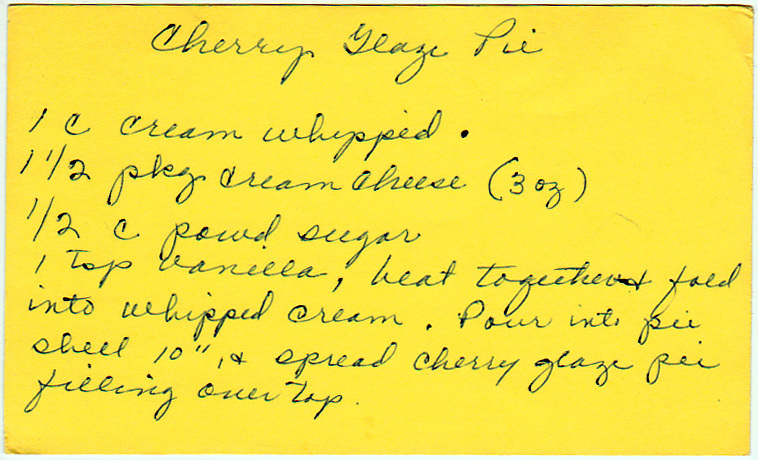 Pour into pie shell, 10″, and spread cherry glaze pie filling over top. Or as the kids today might call it, sushi rice. Perhaps something you could have with your mackerel?